Musician Neil Diamond has been delighting music-lovers around the world for nearly 50 years. He first started performing in 1966 and has written international hits such as "Cherry, Cherry", "Girl You'll be a Woman Soon" and "
With more than 140 million albums sold worldwide, Billboard magazine has ranked Diamond as the third most successful adult contemporary artist of all time – ranking only behind Barbra Streisand and Elton John. He's been nominated for 12 Grammy's in his career and was included in the songwriters hall of fame in 1984. Born in Brooklyn New York, Diamond has often been referred to as the "Jewish Elvis," and is known for wearing loud sequined shirts during concerts. Before deciding to become a musician he studied medicine in college. Next month Diamond will release his latest album entitled "Dreams" which is a compilation of interpretations of his favorite songs by other rock artists. This is your chance to ask the musical legend you question! Send in your questions for Neil Diamond now and don't forget to tell us where you're writing from! 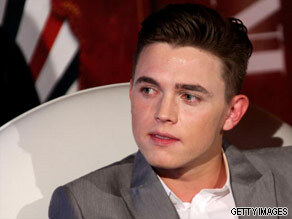 Singer, songwriter, actor and teen heartthrob - all titles that twenty-three year old Jesse McCartney is happy to have. Jesse McCartney is your Connector of the Day. Born in New York in 1987, McCartney first rose to fame in the U.S. as a singer for the boy band "Dream Street." The band was extremely popular among young teenage fans and their debut album was certified gold and peaked at number one on the Billboard's Independent Albums chart. Unfortunately for the band though, the group split up because of legal battles between the parents of the singers and management. Despite this, Jesse McCartney soldiered on and recorded a solo album called "Beautiful Soul" in 2004. The album was a massive hit and was quickly certified platinum. At the 2005 Teen Choice Awards, McCartney came up a big winner and won multiple awards including choice male act and breakthrough artist of the year. McCartney's second album was called "Right Where You Want Me" and was generally seen as being a more mature collection of songs than his first. In addition to his musical career, McCartney has also branched out into acting and held a regular role on the U.S. television drama "Summerland." He also had a recurring role on the show "Greek." Today, McCartney is working on his fourth album which is due out for release later this month. Here's your chance to have your questions answered by Jesse McCartney. Please leave your questions below and be sure to tell us where you're writing from. You can also leave your comments on our brand new Facebook fan page - just visit www.facebook.com/CNNconnect . Japanese chef Nobu Matsuhisa's culinary creations has become a luxury diet for many high profile celebrities and foodies across the globe. Nobu Matsuhisa is our Connector of the Day. Matsuhisa, owns and operates more than a dozen high end restaurants and is generally regarded has one of the world's top chefs when it comes to Japanese fusion cuisine. There are Nobu restaurants in cities like London, New York, Los Angeles, Hong Kong and Mexico City. Matsuhisa was born in Saitama, Japan and began working in restaurants soon after finishing high school. After working at Matsue Sushi in Tokyo, he was invited to work in Peru by a regular customer. At the age of 24, Matsuhisa opened his own restaurant in Lima and that began his Latin American cooking career. Today, Matsuhisa is well-known for incorporating South American cooking styles and ingredients into traditional Japanese food. 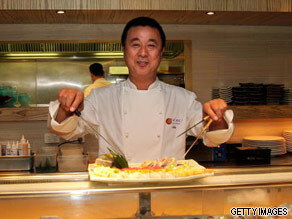 Please leave your questions for celebrity chef Nobu Matsuhisa below.